From 23-26 January, the “4th International Youth Forum on Antenna Multidisciplinary Design and Measurement” was held in Urumqi. 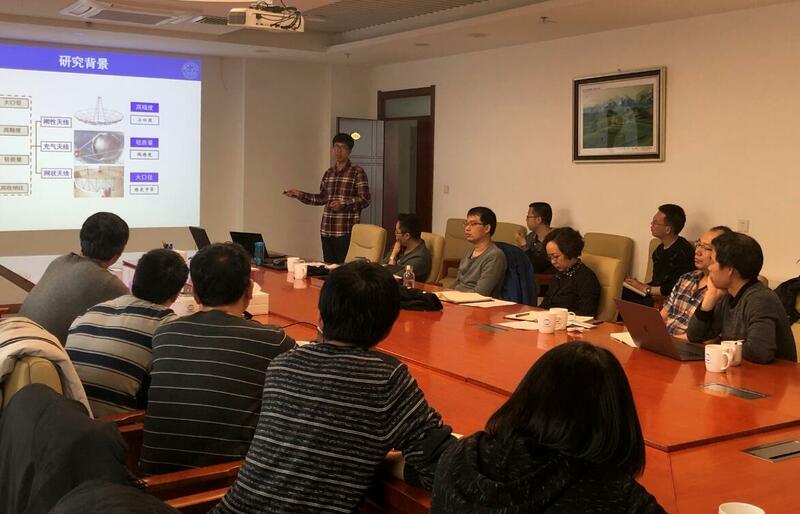 Organized by Xinjiang Astronomical Observatory (XAO) and XiDian University, the forum focused on the theoretical and methodical studies of key antenna-related technologies of the STeerable 110m Aperture Radio Telescope, START (QTT project). Xu Qian, head of antenna group, served as the chairman of the forum, and Wang Congsi, vice president of the School of Mechanical and Electrical Engineering of Xidian University, served as the vice chairman. The forum attracted nearly 21 delegates to attend. Topics of the forum included thermal deformation control scheme for large reflector antenna, fault mechanism analysis and health management of antenna transmission system, virtual prototyping technology for large reflector antenna, Real-time position and attitude calculation of large aperture antenna panels based on edge sensors, and electrostatic forming membrane antenna. After the meeting, the participants visited the Nanshan site for investigation of the operation and research status of the 26-m antenna. Dr. Na Wang, Director of XAO, stated that the team at XiDian University has been following the QTT project for a long time and continuously deepened in research of related theories and methodologies on various key technologies and strategies, which laid a foundation for QTT construction. It was our hope that all the research results could be integrated with the QTT project so that our efforts were worthwhile. Wang, Congsi, Vice president of XiDian University believed that colleges and universities are skillful at theories and method research. However, these skills required interfacing with specific practical projects. He said that we would continue to closely integrate our knowledge with the engineering requirements and provide technical supports for practical use of the QTT antenna. This forum has clarified the mission of XAO and XiDian University on performing further experimental verification in the aspects of structural health monitoring for antenna, Influence of environmental load on antenna structure and electrical performance, and servo control strategy. By means of resolving key issues with the QTT project, we have successfully applied for a number of projects so that a group of young talents had the opportunity of receiving training as future main research force. As one of the series of joint academic forums, its influence is expanding, and the scale and importance of future forums will be upgraded in order to secure the talents for constructing QTT as a world-class antenna.